Please join us for a sensational evening of dinner, live & silent auctions, entertainment and dancing to celebrate St. Joseph’s Villa’s 140th Anniversary. Celebrating our Foundation’s 40th anniversary, guests flooded Liuna Station in support of St. Joseph’s Villa for a soirée with all the style, flair and romance of Paris in springtime. The evening was presented by long-time friends of the Villa Foundation, Taylor Steel. His Excellency, Bishop Douglas Crosby, Honourary Gala Chair, gave warm and deeply heartfelt remarks about the legacy that the Villa continues in our community and our exciting future of in caring for individuals and families with the opening of our new hospice in the fall of 2019. Maureen Ellis, our President & CEO, ignited the audience with her passion and powerful words of inspiration. Past board members, political dignitaries, Villa staff, corporate partners, members of the medical community and friends of the Villa shared this historic moment and reflected on the impact and importance of caring for seniors during a commemorative video created by the talented team at Greening Marketing. Gala Committee Chair Irene O’Byrne and her committee created an enchanting and unforgettable experience for guests. And there were a few surprises! The high-end, designer gifts featured in our silent auction and raffle delighted the imagination. The multi-talented award-winning John Ellison and his band entertained our crowds and had them dancing until well after midnight. Thank you to all of our sponsors, donors, supporters and friends. Taylor Steel & Taylor Chrysler Dodge, LiUNA Ontario Provincial District Council, LiUNA Local 183, AstraZeneca, CARSTAR, KPMG, Mathews Dinsdale LLP, Medical Pharmacies, Diocese of Hamilton, First Ontario & McCallum Sather Architects. 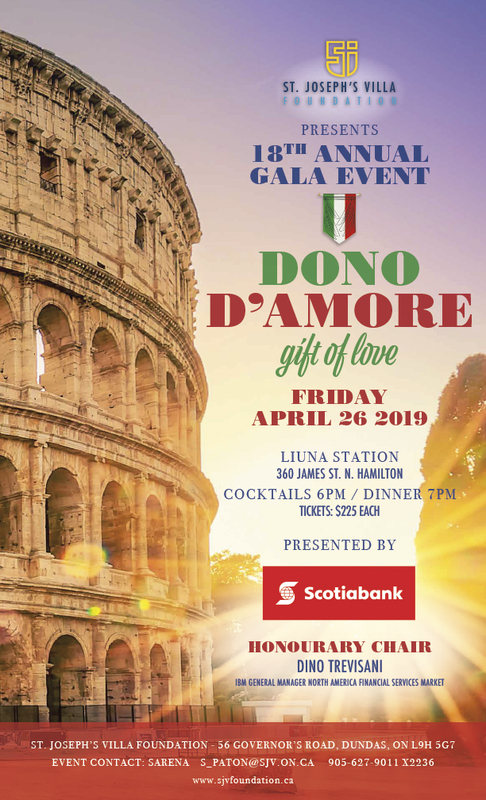 Thank you to Ancaster Mill & Pearle Hospitality, Barry’s Jewellers, Chef Mel & Chantal Chamberland, Dino Trevisani & Ainsley Kerr, Kevin Martin Jewellers, Myles Travel Plus, Philip Lowry, Quatrefoil Restaurant, Sims Advertising, Via Rail, Vlasta Cameron, WestJet Airlines and many more! Plans have already begun for 2019. This is one gala you won’t want to miss!